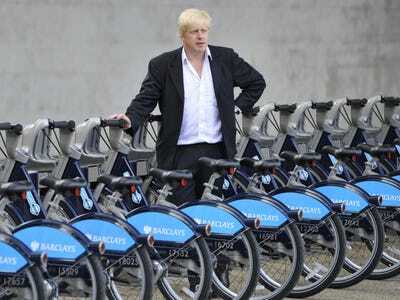 REUTERS/Toby MelvilleBoris Johnson, Mayor of London, poses with the Barclays bikes on the day they were launched, 30 July 2010. The Transport for London Barclays Cycle Hire Scheme is doing great. The monthly figures released by the London Database show that 2014 is set to become a record year for the bike-sharing program, increasing the appeal for a new sponsor. Since the scheme was launched at the end of July 2010, daily users have almost doubled, alongside an increase in the number of bike depots. The graphic below shows the evolution of the bike hire since its very first day, highlighting expected growth during the spring/summer and a decrease in the winter. In 2012, you can see that the Olympics boosted the number of bike users, with more than 40,000 bikes going a day during several days of the games. And after a lower-than-expected performance in 2013, the bikes shares are back up again this year. Three of the five busiest days in the program’s history were in 2014, with April 30 claiming the top spot with 49,025 single users. The Tube workers union strike was scheduled that day, meaning that hundreds of commuters had to rely on bikes instead of taking the underground. The second and third busiest days ever were August 9 and August 16, with 47,454 and 47,245 daily users, respectively. This year, an average of 27,827 people hired a bike every day, up from 14,070 in 2010.